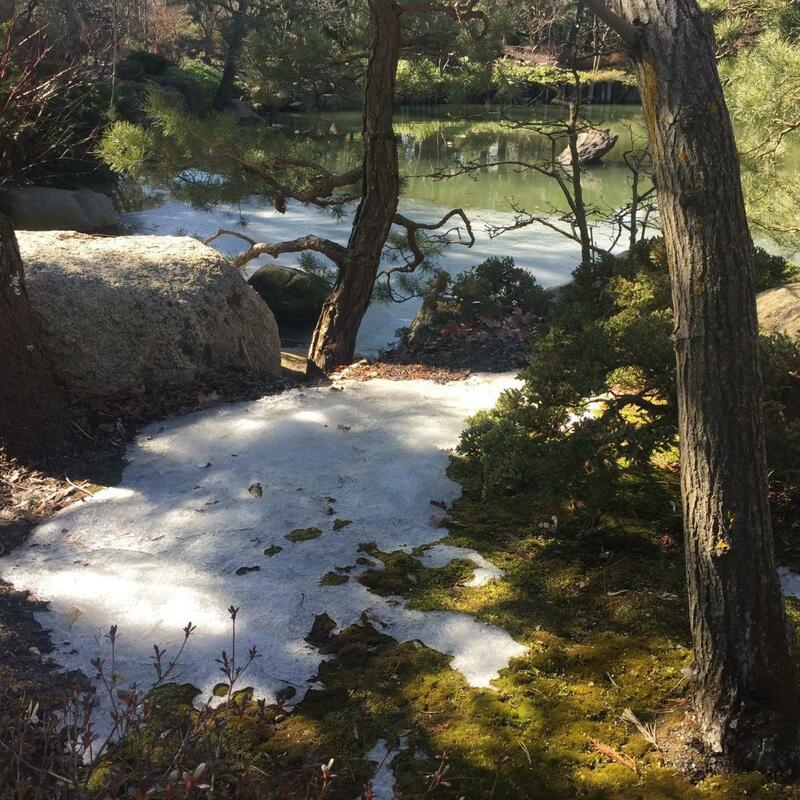 Snow was thick on the ground and on the branches of the trees when I last visited the gardens. It was a Sunday, and I had gone to church that morning. The pastor spoke about the concept of a “beauty walk”—that is, taking walk out in the world with the sole purpose of noticing and appreciating beauty. One can take a beauty walk on the streets of a city or the trails of a forest preserve or the paths of a garden or even the hallways of an office building. Beauty is everywhere, in everything. I took my own beauty walk through the snowy Anderson Gardens that day, and wrote this small poem afterwards. The light gradually faded outside the large windows as I sat there, writing, thinking; the outlines of the pine trees grew dim, the patterns in the gravel less distinct; the whites and greens and blues of the world drained to grays and blacks. When I left, I followed the deep tracks in the snow I had made on my way in. I love the winter, and I love the snow. It blankets, it quiets, it calms; it is beautiful, it is stunning, its shining crystals, its spinning flurries; the ice which hangs in spears, which covers in treacherous sheets; the ice which claims, serenely, the surfaces of our lakes, ponds, and streams…and even the rivers, on those coldest days—even the Rock River freezes over. Now the snow is melted, the sun is shining, we have been granted some warmth; the river has swelled, surging, drowning the bike path, invading our ordered spaces, breaking free; spring is on the way, flowers are on the way, new life is on the way. I cannot wait. What better time for a beauty walk?